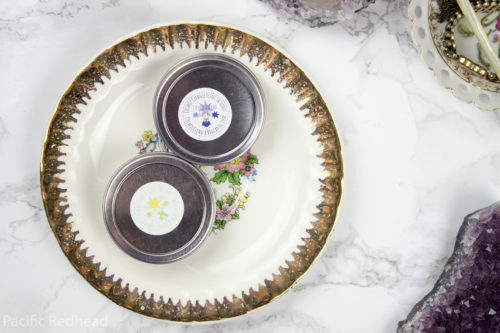 At the beginning of January I did a post on Cosmic Cleanse reviewing their miracle budders and sugar scrub; while also talking about the helpfulness of CBD on our health and different aches & pains. You can review that post here. 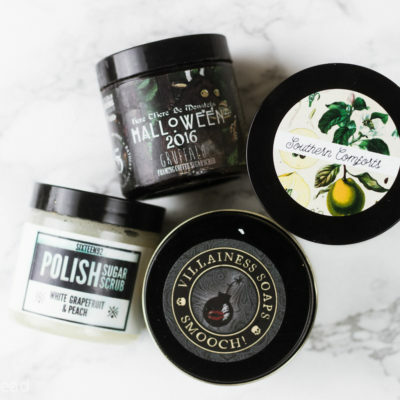 Well here I am again, I recently purchased some new products from her January Retro Restock and I wanted to share first impressions and some quick reviews of the scents with all of ya’ll. For those of you who missed my last post I did link it above but I will also include my information at CBD in this post and why I chose to get all of my products infused. Cannabidiol is a chemical compound found inside the resin glands (trichomes) of a female cannabis plant. These chemical compounds are known as cannabinoids. These cell receptors make up a larger endocannabinoid system. The endocannabinoid system helps control everything from mood, cognition, movement, appetite, immune response, sleep, ovulation, and sperm development. Unlike tetrahydrocannabinol (THC) CBD is non-psychoactive, meaning you won’t get “high” or feel stoned. It will have affects on your body but it won’t send you down happy rainbow bridge into highland. The cannabinoid activates receptors such as vanilloid, adenosine, and serotonin receptors. CBD doesn’t have to be smoked either. You can find it in capsules, tinctures, and commonly mixed with coconut oil as a carrier. Which is what Heidi at Cosmic Cleanse does for her products. Heidi did provide me a few extras in my box in order for me to photograph them for her for the Cosmic Cleanse website and other promotional materials. I will note those with a (H). All of my products are infused. 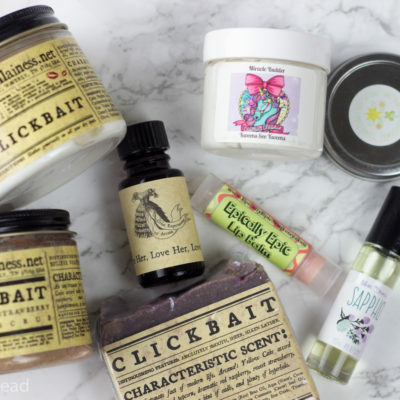 Lip Bombs – I think if I was going to order these again next retro restock I’d do both in a tub. I really like how solid the tub feels and it fits great in my purse for on the go. 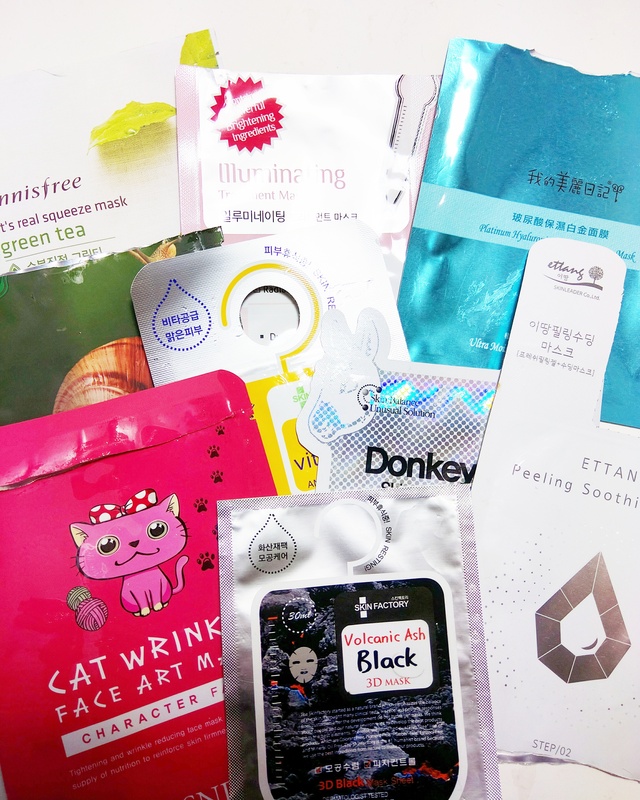 They are super moisturizing but not too slippy or oily feeling. Both of the scents Bubble Gum & Peach are very true to life smelling and not artificial at all. They have a lightly sweet flavor but I don’t find overwhelmingly so. I’m normally not a huge fan of bubblegum scents but I do like this one. These were .25oz jar or tube for $4. Ingredients: Soybean Oil, Candelilla Wax, Sunflower Oil, Cocoa Butter, Shea Butter, Vitamin E, Aloe Vera Oil, Coconut Oil, Cranberry Seed Oil, Lip Safe Colorant & Sweetened Flavor Oil. (may contain stevia). 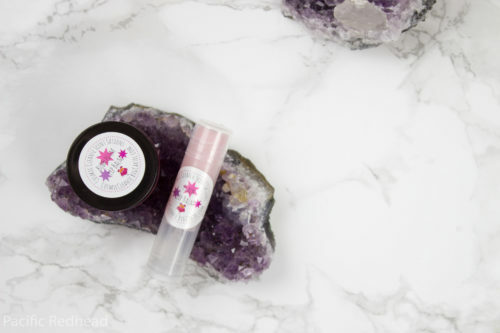 Cosmic Temple Balms – I’m happy Heidi sent me these for photos, they were the one item I wasn’t sure of because of the herbal scents but they scents are fairly light and not in your face. I often have issues with overly herbal smelling things which is why I tend to avoid them. I used a bit of Cosmic Dreams the other night when I had a headache as I was falling asleep and I felt it did help dull the ache as well as the scent was calming and relaxing, which allowed me to not stress about my head hurting as I was trying to fall asleep. Rise n Shine is a lightly minty fresh green scent & Cosmic Dreams is a orange lavender with a little light woodsiness. These were $6 in a screw top metal tin. 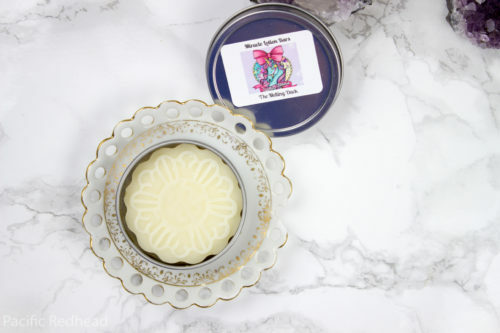 Ingredients: Coconut Oil, Beeswax, Sweet Almond Oil, Avocado Oil, Essential Oils & Vitamin E.
Miracle Lotion Bar – I got mine scented in The Melting Duck which is this glorious pistachio scent. I love anything scented like pistachio, it is nutty with a hint of a cherry like scent. These leave behind a stay with you scent. 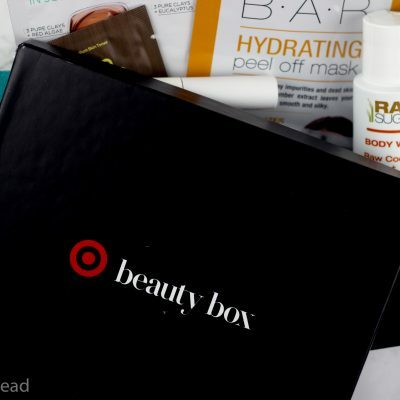 They offer a lot of moisture for not needing a lot of the product. I take the bar in my hands to warm it up and rub it around once or twice and then use my hands to apply to my arms and anywhere else I’d like. 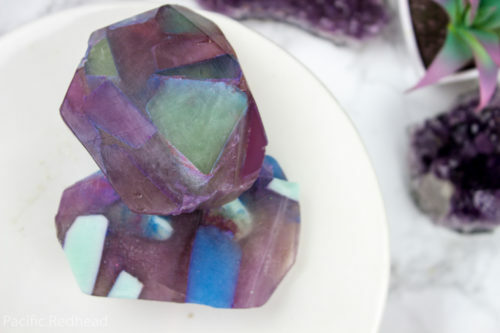 These would also make an amazing massage bar. I feel lightly moisturized but not greasy, no film left behind on my skin or weird texture. These are 2.5oz in a screw top metal tin and were $9.00. 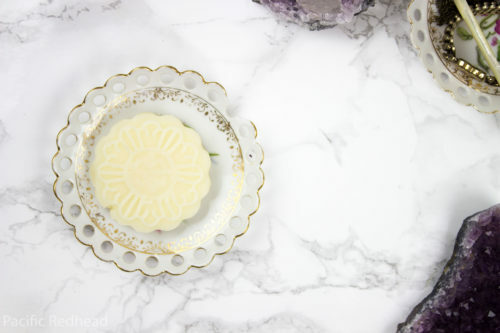 Ingredients: Cocoa Butter, Mango Butter, Beeswax, Sweet Almond Oil, Shea Butter, Avocado Oil, Macadamia Oil, Olive Oil, Argan Oil, Rice Bran Extract, Rosemary Leaf Extract, Sunflower Seed Extract, Coconut Oil, Fragrance Oils & Vitamin E.
Gemstone Soap – These are just GORGEOUS. I always complain about soap bars because they leave that weird film on your skin and I don’t feel like these do that. I’m glad that with my order I also got a little sample soap because I didn’t want to sully my big ones yet, I’m still admiring them. I see a lot of bar soap in the Indie world and none are as stunning as these. They lather but nicely and leave your hands feeling clean with a light scent left behind. 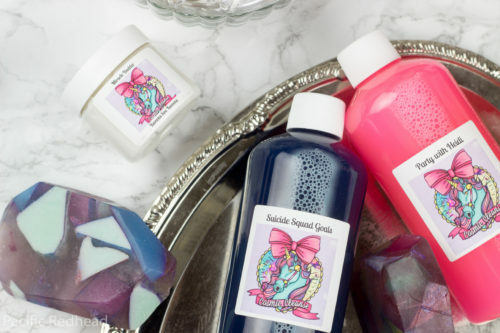 I already loved Party with Heidi and its sweet fizziness but Suicide Squad Goals has stolen the show for me, I’m glad I also got it in bubble bath. SSG is fruity, fruity, fruity! It’s all strawberry & guava for me balanced out a little something lightly zingy. Its official notes are Serendipity, Strawberry, Raspberry, Guava, & Blonde Moment. These were $9. 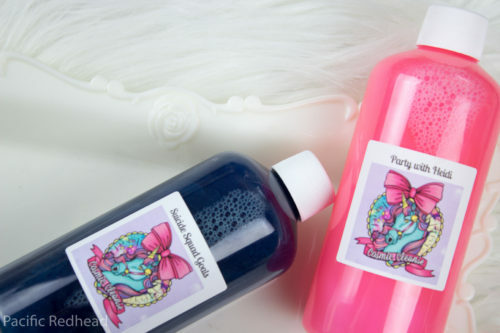 Ingredients: Glycerin, Lye, Coconut Oil, Castor Oil, Palm Oil, Canola Oil, Olive Oil, Dolce Extract, Evening Primrose Extract, Aloe Extract, Mica Mineral Pigments, Colorant, Fragrance or Essential Oils and Vitamin E.
Bubble Bath – I’m definitely a bubble bath girl, always have been. I occasionally take baths and when I do there better be bubbles and I mean BUBBLES. I got mine in Party with Heidi (my favorite fizzy scent) and Suicide Squad Goals. Both of these have such gorgeous shimmering pigments in each that I just couldn’t capture on camera. I already used SSG and for my bath I used 2-3 cap full of bubbles and it definitely filled my bath to a nice level of bubble. (I’d take a photo but my lighting in my bathroom is awful, if you’d like to see snips of my bathes follow me on Instagram and look at my stories, I usually will post them there.) It left the water a nice lightly shimmery blue color and had a moderate amount of fragrance. I really like that I don’t have to use an insane amount of bubbles just to get it to fill my tub the way I want. These were $11 for a 10oz bottle. 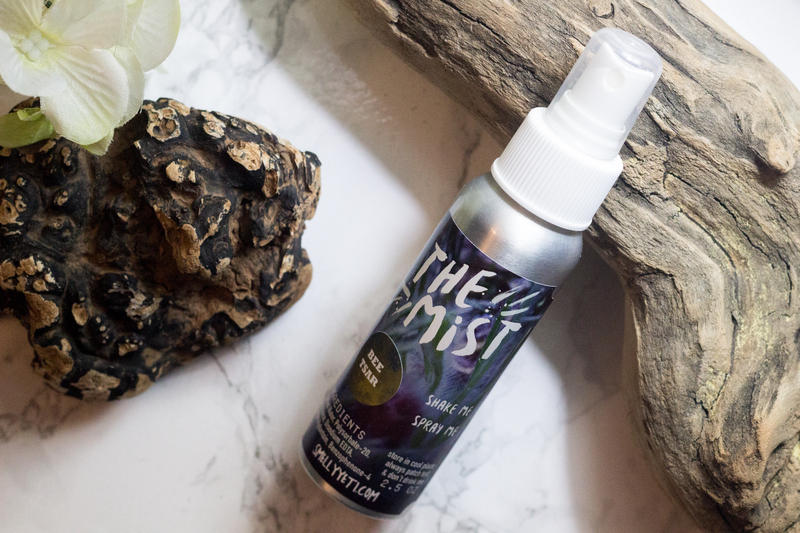 Ingredients: Deionized Water, Sodium Lauryl sulfate, Sodium C14-16 Olefin Sulfonate, Cocamidopropyl Betaine, Cocamide DEA, Glycol Distearate, Laureth-4, Whole Dry Milk, Whole Milk, Buttermilk, Aloe Vera Leaf Juice, Witch Hazel Distillate, Coconut Oil, Chamomilla Recutita (Matricaria) Flower Extract, Phenoxyethanol, Ethylhexylgylcerin, Caprylyl Glycol, Hexylene Glycol, Citric Acid, Sodium Chloride, FD1C Colorant, Shimmer Mineral Pigments, Fragrance Oils. 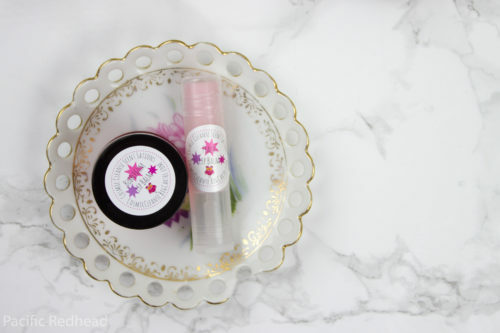 Miracle Budders – Now, I already talked about these in my last post but Heidi has updated the formula a bit so I’m going to do the same I did last time and discuss the scents and then the consistency and absorbability. I got two mini sized and two 6oz. I love that Mini’s were offered, they are perfect for my makeup bag in my purse for on the go or travel. Fruity ripe strawberries with a sweet rich cheesecake and a big ol’ bowl of fruit loops. This is a great fruity scent with a little bakery in the background. On my body after applying the fruit loops stands out the most. Kweens See Kweens is fruity cotton candy, I get mostly the raspberry guava with a big ol’ kick of cotton candy. The cotton candy isn’t super sweet and isn’t like those bad 90’s cotton candy scents. I haven’t used this one on myself yet to say how it smells on my body. I mentioned earlier in this post about how much I love Pistachio. It’s nutty, sweet and always has that cherry kick. With the addition of it being PPC it has this sweet custardy smell topped with sweetened condensed milk. After applying it is lightly pistachio with sugar milk. 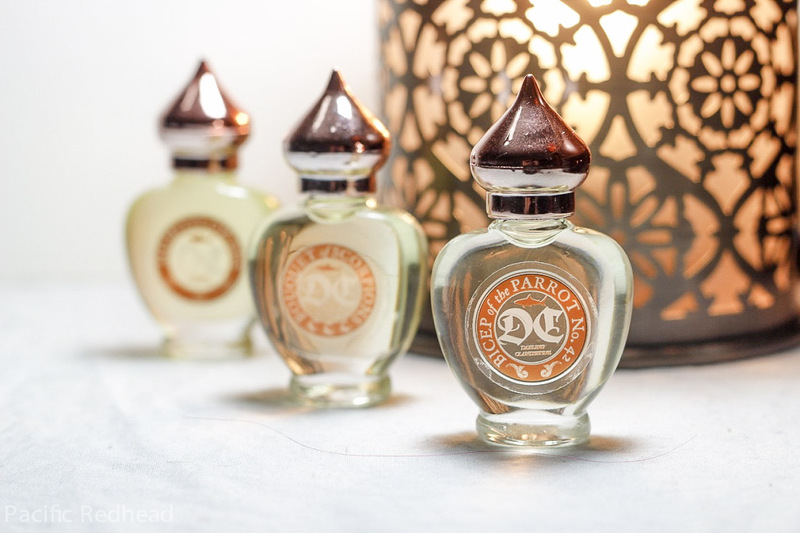 I always appreciate that while these budders do leave a scent on your skin I don’t find them overwhelming and I do think the scents layer well with perfume so as an avid perfume wearer I don’t feel overwhelmed with scents. Amish Friendship Bread always has these nice bready cinnamon smell and the cotton candy plays interestingly with it. It adds a not quite tart sweetness. It has a little vanilla pudding type scent as well I haven’t used this one on myself yet to say how it smells on my body. 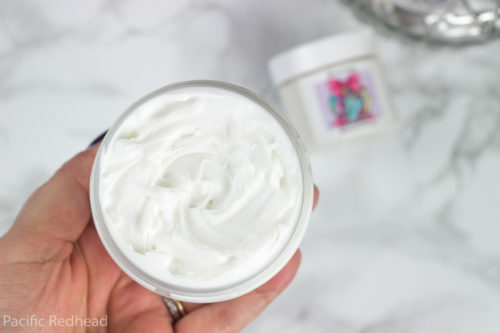 So Heidi updated the formula a bit and added even more BUTTERS! So it is now thick and rich and more like a true body butter and not a more loose texture. It is fluffier and richer in texture. I LOVE IT. It soaks in so easily and leaves behind a good amount of scent as I noted above. It doesn’t feel greasy and doesn’t leave behind any weird films. My skin feels moisturized and smooth. 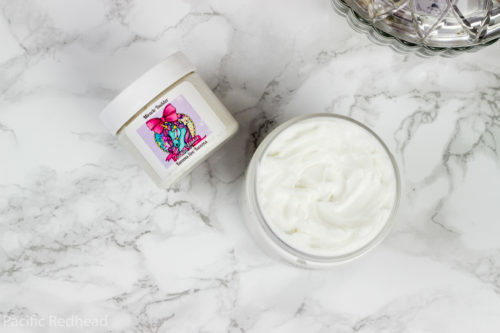 I have dry skin all across the board thanks to my hypothyroidism and these definitely help against any dry patches that many arise. I did read in a comment in her Cosmic Cleanse Unicorns group that this will be the formula moving forward and I’m super happy about that. The Miracle Budder is by far my favorite lotion from any Indie Vendor I’ve tried over the years. Out of the numerous companies I’ve tried at this point only one other I’ve found has a similar whipped butter textured lotion and that’s Sugar & Spite and the body cream I got in one of her special boxes. Mini were $3.75 each and 6oz jar are $12 each. Ingredients: Shea Butter, Cocoa Butter, Coconut Oil, Grapeseed Oil, Apricot Kernel Oil, Fragrance/Essential Oils & Vitamin E.
Did you order from this preorder? If so, what did you get? If you aren’t in her group on Facebook, you can join here and vote on the scents for the upcoming preorder which doesn’t have an official date just yet. Cosmic cleanse is one of my fav brands ever! I need their stuff if not for the cute packaging!! I have to say cosmic cleanse has been one of my favorite companies and they opened me to the reality of cbd helping me with my fibromyalgia!! Im so happy and thankful! Thankd for posting that study as well!! you’re so welcome! I hope the study gave some people some insight into CBD. I have never heard of cosmic cleanse it sounds wonderful.